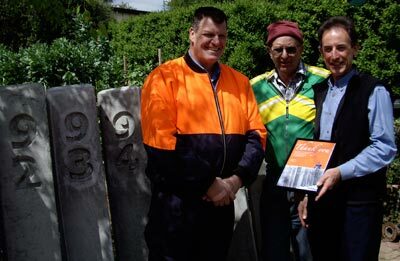 Hanson Bendigo’s contribution to restoring part of the history of the O’Keefe Rail Trail was recognised when the Friends presented a certificate of appreciation to Kevin Benbow, Plant Manager, early in October. Ken Benbow of Hanson Bendigo accepted a certificate of appreciation from Ken Hanson and Garry Long. The company has donated all the concrete to recreate 11 ‘mile’ posts, which will eventually be installed along the trail between Bendigo and Axedale. Convenor of the Friends, Garry Long, said that you really have to see the size of these posts to realise what has gone into making them. The posts have been manufactured over the last six months by member of the Friends group, Ken Hanson (no relation), who created a mould based on an original number 92 mile post. The original posts were buried to half their height in the ground, but when this railway line was decommissioned most of the mile posts were removed. “Although it may be some time before the council has the trail ready for the posts to be installed, we’ll be ready when they are, ”said Garry.